It’s a Showcase first! 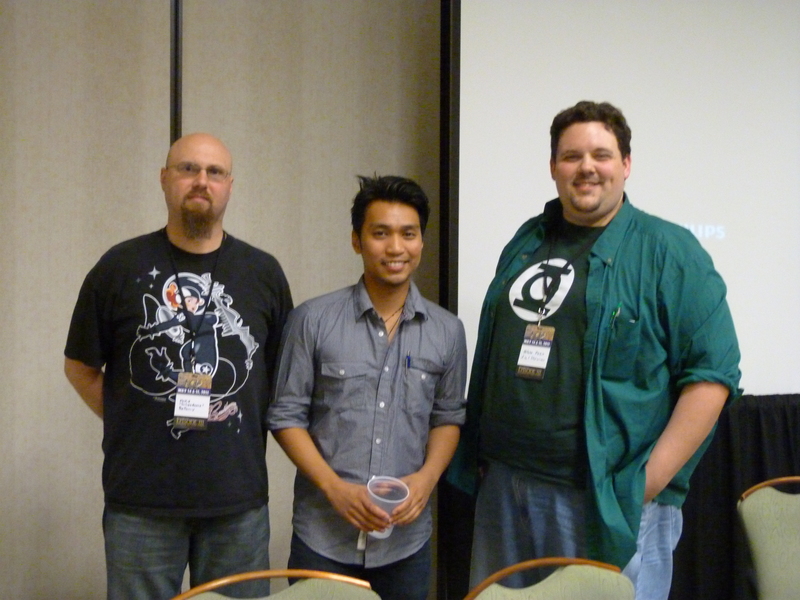 Last week at Nola Comic-Con, the boys were lucky enough to host a few panel discussions, and we’re bringing the audio to you. This week, we talk with DC superstar artist Francis Manapul about getting started, his evolving art style, his work on Flash, his appearances on the TV show Beast Legends, and a hint about who’s going to be writing his next project. In the picks, Blake recommends Rocketeer Adventures #1! Contact us with comments, suggestions, or anything else at Showcase@CXPulp.com! Nola Comic-Con 2011 Day One! Just got home from day one of the 2011 Nola Comic-Con. We had a blast today, and the Showcase crew managed to snag some choice audio. Hopefully, we’ll be able to share it all with you, including our panel discussion with DC artist Francis Manapul and a panel that was practically a who’s who of the New Orleans comic book scene. And there’s still a day left — if you didn’t make it, head on out to the Westin Canal Place tomorrow and join us! And look for the first of what will be several Nola Comic-Con podcasts tomorrow! Okay, gang, how about another roundup of recent comic book releases. 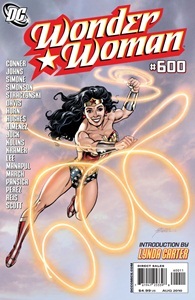 I’ll give you my usual slate of Brightest Day comics, then tomorrow I’ll get into some other recent books, including a few Heroic Age comics and the big Wonder Woman #600 that all the kids are talking about. Let’s get to it. 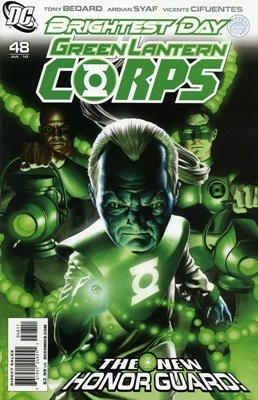 Green Lantern Corps #49: In part two of “Revolt of the Alpha-Lanterns,” Boodikka and John Stewart undertake a mission to planet Grenda, home of the robot Lantern Stel, who has gone incommunicado. 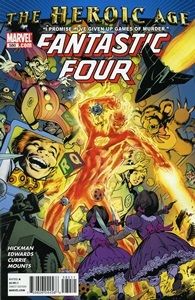 Shortly after his arrival, though, John finds himself under attack by an unexpected source, and Kyle Rayner, Ganthet, and Soranik Natu go out to rescue the rescue mission. We also get a glimpse of the fallout from Deadman’s battle with the Anti-Monitor in Brightest Day #3, as it seems to be playing into this storyline. Ever since the Alpha-Lanterns were introduced, there’s been something distinctly creepy about them, and this issue seems to be pulling the curtain back a bit on them. We’re getting to see some of what they’re really up to, and while we still may not quite know why they’re behaving this way, the fact that they are is disturbing enough. Tony Bedard does still have room for character beats, though. The recent return of Kyle’s late ex-girlfriend, Jade, is causing trouble in his current relationship with Soranik. 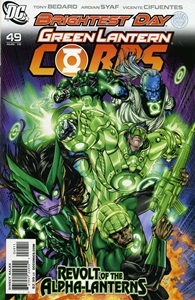 We also really get to see what makes John Stewart tick in this issue. I’m very happy that he’s joined the cast of this book full-time, as in just two issues he’s gotten more exposure than he did in the past 25 issues of the core Green Lantern title. 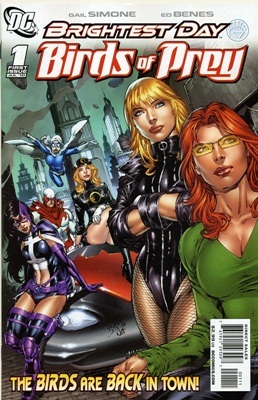 Ardian Syaf gets to play with a lot of redesigns this issue, and he does a fine job. 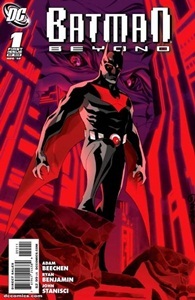 He’s rapidly rising up the ranks of DC’s bests artists, and this is one of DC’s best comics. Green Arrow #1: Hey, look, it’s a Green Arrow #1! It must be at least two, three months since we had one of those. At the beginning of Brightest Day, the devastated Star City became the site of an enormous star-shaped forest. 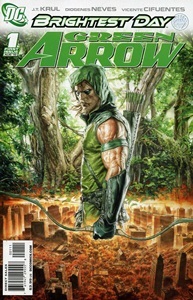 Oliver Queen, now unmasked and disgraced as Green Arrow due to his murder of Prometheus (in Justice League: Cry For Justice), has taken to living in the forest, where he has become far more literal a modern Robin Hood than ever before. Not surprisingly, this issue is a lot of set-up. We find out where Ollie has been and what he’s been doing since we last saw him, and we see what’s been happening to the power structure in what’s left of Star City. At the end of the issue, we see once again just how this title seems to be keyed in to Brightest Day, with a nice little reveal. While I’m still not sold that this revamp of the character justified yet another first issue for Green Arrow, I really do like what J.T. Krul is doing with him. He’s got a very good feel for Ollie, for who he is, for what he’s doing. Diogenes Neves’ artwork is strong, and interestingly enough seems to work better in the forest than in the city. Mauro Cascioli does a flat-out fantastic cover, one that really knocks my socks off. It’s not a knockout first issue, but it’s a strong one. 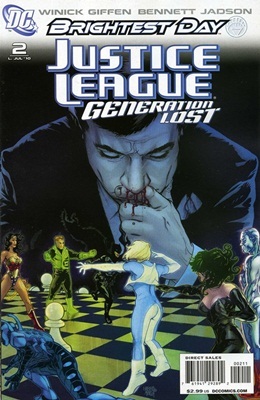 The four JLI members who remember Max Lord, along with the new Blue Beetle, find themselves in Russia, unwillingly drawn into a conflict between a rogue Rocket Red and an entire squad of the armored Russian warriors. The new Rocket Red, a terrorist dedicated to the restoration of the Socialist rule, finds an unexpected ally in the former Justice League, and it’s Booster Gold of all people who starts to piece together what’s going on. Like many of the characters who returned from the dead, this issue we start to see that Maxwell Lord’s powers aren’t exactly like they were before his death. I find this particular mystery very interesting, and I’ve very much enjoyed watching it play out in several of the Brightest Day-branded titles. The reluctance of this group to form a team is also a really interesting way to play things. 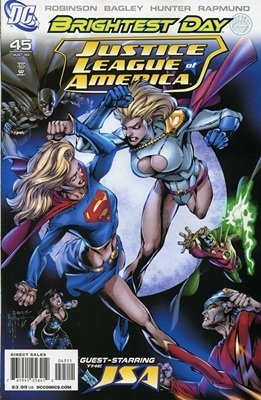 Judd Winick’s Power Girl last week didn’t impress me much, but his collaboration with Keith Giffen has been quite strong since this book launched. 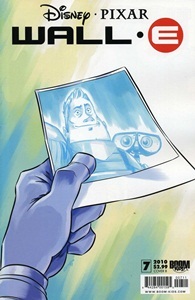 I’m enjoying the story, the mystery, and seeing these characters together again, which is what you want whenever this particular band is brought back together. 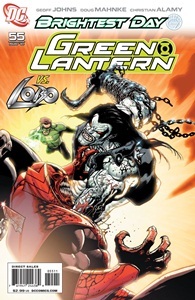 Green Lantern #55: Lobo is back, and he’s on Earth to collect the bounty on Atrocitus. As the White Lantern still seems to want Atrocitus around, Hal Jordan finds himself in the odd position of defending the Red Lantern, along with Carol Ferris and Sinestro, from the last Czarnian. 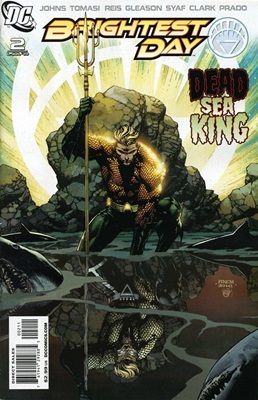 There’s a ton of action this issue, and Doug Mahnke does a great job of laying it out. The inks on this issue, though, are a little looser than I would like. 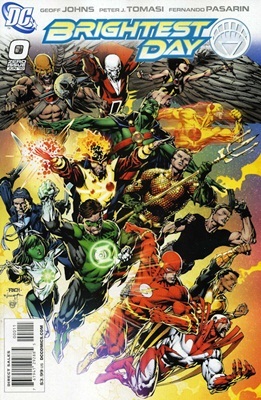 Aside from the fight scenes, Geoff Johns also delves into the mystery of the strange being that seems determined to capture the Entities that embody the seven Corps. This has been a very strong element in this title, once that’s helped to propel the story forward since Brightest Day began. 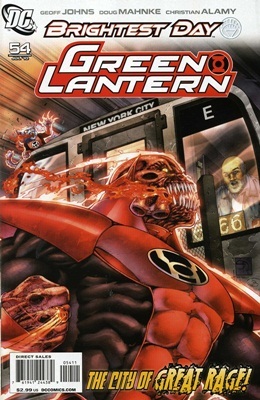 We also get a back-up story illustrated by Shawn Davis, the origin of the Red Lantern Dex-Starr. What exactly could take a cat from Earth and turn him into a brutal member of the rage-filled Red Lantern Corps? It’s a sad story, no surprise, and the last panel will break the heart of pretty much any cat-lover. Despite myself, I can’t help but hope that Johns returns to this story at some point and gives Dex-Starr the chance for a little payback. 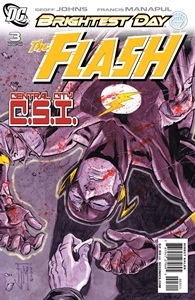 The Flash #3: Another Geoff Johns comic (the guy writes a lot of them, doesn’t he?) returns to the resurrected Captain Boomerang. Boomerang is back in prison, where he’s been given the “assignment” to break out before his fellow Rogues will consider accepting him back into the fold. 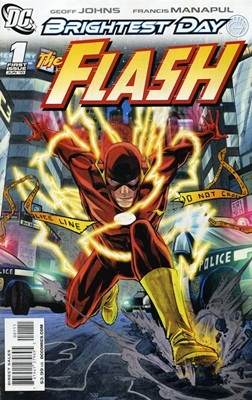 Barry Allen, meanwhile, is being pursued by the Renegades – Rogue-based cops from the 25th century – who are accusing him of the murder of one of their own… a murder that hasn’t happened yet. This is a damn ominous issue. Not only is Captain Boomerang shaping up to be much more of a threat than he’s been in the past, but Johns briefly brushes up against just why Barry could be driven to kill Mirror Monarch. Here’s a hint. Barry has killed before. Anybody remember what it was that drove him to it the first time? 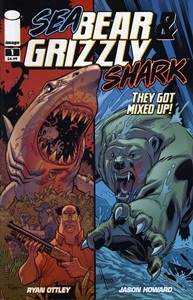 Two more things to love about this issue. 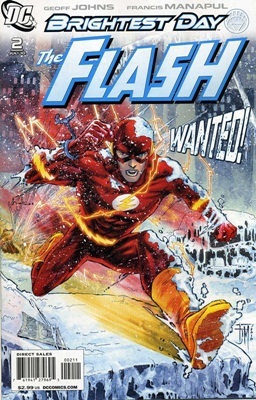 First, Johns has brought back the old-school “Flash Facts,” with the help of artist Scott Kolins, giving us both actual science (how a Boomerang works) and some “Secret Files”-style in-world info, in this case about Captain Boomerang himself. The other thing to love is the art of Francis Manapul. I don’t know if it’s an improvement in his style or the colors of Brian Buccellato (or a combination of the two), but his style on this book is so far ahead of his work on Legion of Super-Heroes just a few years ago that you couldn’t tell it was the same artist. It’s fantastic. 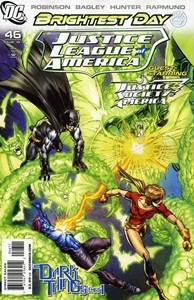 Justice League of America #46: After a two-issue prologue, the JLA/JSA crossover “The Dark Things” begins in earnest this issue. The Starheart has taken over Green Lantern Alan Scott, and the power is spreading across the Earth, causing magic- or elemental-based heroes and villains to lose control and wreak havoc on the world. 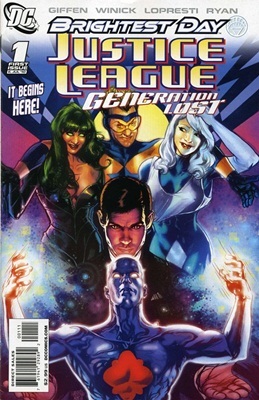 The Justice League and Justice Society spring into action to shut down the elementals, while the newly-returned Jade tries to use her altered powers to try to figure out what’s happened to her absent father and brother. James Robinson does good work balancing the two groups of characters and exploring some of the new relationships that this team is afforded – Congorilla and Jesse Quick, Nightwing and Supergirl… characters that we haven’t seen together very much, but work well together. 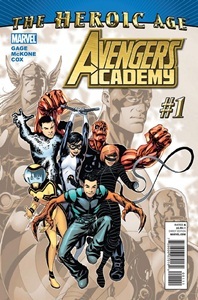 Mark Bagley juggles a ton of characters this issue and he’s got a good feel for most of them. 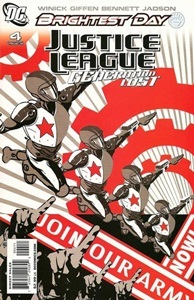 The young League looks great, the older JSA not as much, and that’s just a consequence of his style. He’s always done young characters very well. 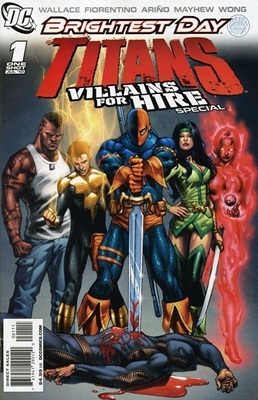 In the back-up story, Pow Rodrix illustrates the tale of two JLA members that don’t appear to be on the current team. Cyborg has helped develop a new technology that may prevent Red Tornado from ever having his body destroyed again, but when Red Tornado loses control, that’s a pretty big problem. The story isn’t clear as to whether Tornado’s loss of control is related to the Starheart in the main story, but I rather hope it is, as it will give the second story a bit more weight. Tomorrow, some comics that have nothing to do with Brightest Day.